August 31st is National Burger Day, which I presume is all about celebrating the burger rather than raising awareness, as it seems to be ever popular and increasingly so. Like most people I love a good burger and, despite having eaten in many of the top restaurants the capital has to offer, I find a quality burger hard to beat for a satisfying and pleasurable meal. This got me thinking as to why burgers are such a fantastic option and why we are currently seeing a meteoric rise in the number of gourmet burger chains. In London we have access to great burgers almost everywhere with the likes of Gourmet Burger Kitchen, Honest Burgers, Byron and Five Guys all firmly established and offering a mouthwatering variety. There are of course numerous other chains, in addition to a growing number of high quality independent establishments. The burger’s popularity doesn’t stop there: virtually every pub and restaurant has a burger on the menu, including a number of high-end restaurants. And, as more and more burger restaurants open up, chefs are trying to out-do each other all over the capital. For example, the small Red Dog Saloon chain has The Devastator: three six-ounce patties, 200g of pulled pork, six bacon rashers and six slices of cheese, while Hawksmoor currently has the awesome Big Matt Meal on offer which features two dry-aged British beef patties with Sparkenhoe Red Leicester, iceberg lettuce, onions, pickles and a special sauce in a sesame seed bun. Going one step further is The Drift, in the Heron Tower, which has a double cheeseburger that’s not for the feint-hearted. It’s a toweringly tall beast that comes with two massive patties, pineapple, beetroot, guacamole, mustard mayo and pickled coleslaw. I’m afraid it’s all a bit Man Vs. Food for me – I like a burger I can finish! So what is it that makes the burger so popular? I think the burger’s basic simplicity and its ability to be readily customised is probably why it continues to be so successful. So many choices – plus it’s easy to create at home – and it’s even mobile! It is also a food that appeals to all age groups and a range of occasions – everything from a family lunch to a boozy night out with the boys – or even in mini sizes as a canapé at an event. For me it is fundamental not to underestimate the importance of the bun in all this. Without great bread, there isn’t really a burger…it’s just some meat, maybe with salad and cheese. The bun is the ‘glue’ for any burger: it holds everything together and soaks up the meat juices and condiments. It needs to be fresh of course, but it also has to be the right size and have the correct structure to do the job properly. To me there is nothing worse than biting in to a bun and losing half the filling…and don’t get me started on having to eat it with a knife and fork! A good burger bun needs to toast well, but it should also be soft – and a little sweet – to complement the textures and flavours of the meat. That sweetness is why brioche buns are so popular: we have an extensive range at Paul Rhodes Bakery and in line with the booming burger market, our production has significantly increased in the past few years – we supply buns for Duck and Waffle Local’s amazing duck burger, in its new Piccadilly location, and our burger buns even made it to Ascot this year. 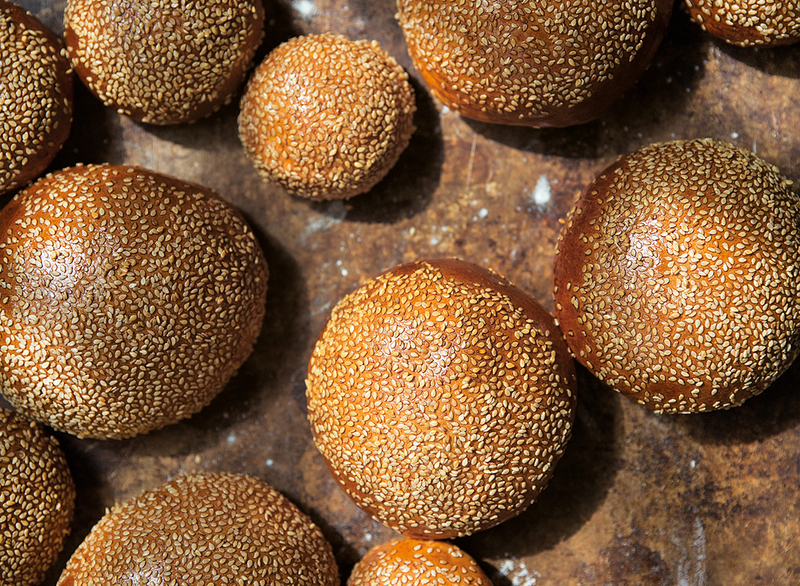 We have recently launched a vegan bun and its demand has taken us by surprise. It took a while in development to ensure the taste and structure were right but sales took off immediately. I take huge pride in the fact that we produce a wide variety of great burger buns as it feels good to be part of this ongoing culinary movement, where quality is winning and the burger is no longer the commodity product of my younger days, synonymous with fast food chains and produced without personality. In many respects the burger market reflects much of what is happening with the UK food market in general: quality is first and foremost, even for everyday products, and food feels important again. Personally I don’t think you can go wrong with either brioche, a white sesame bun – or even a cheeky ciabatta for your burger – but as the nation’s love of burgers shows no sign of diminishing any time soon I’m sure we’ll soon be looking at what else we can offer our customer base. And of course, if any customers have suggestions or bespoke needs – we are more than happy to discuss. We already have one seasonal burger bun in development: as we move into autumn, do keep an eye out for the black burger bun we are creating especially for Halloween. So don’t forget, celebrate National Burger Day on Thursday 31st August. Here’s a simple burger recipe that works well with our brioche buns. • Place all the ingredients for the burgers in a large bowl. Season and mix well. Cover and chill in the fridge for 1 hour. • Using wet hands shape the mixture into 4 burgers. • Heat a griddle pan or barbecue to hot. Brush both sides of the burgers with oil and cook for 3-4 minutes each side or until well browned and cooked. • Grill or toast the burger buns until lightly golden. • Spread the base of each bun with a little mustard and mayonnaise. Add some slices of tomato, lettuce then the burger, red onion slices and the other half of the bun. • Serve with ketchup/relish and fries, if you like. • Crispy bacon and a slice of a good quality cheddar or Gruyère cheese can be added if you wish.